Olomouc is a small city in the Czech region of Moravia famous for its cobbled streets, UNESCO listed column, bizarre communist era astrological clock and most importantly, its micro breweries and pungent local cheese. Having spent the day traipsing around the medieval city there was only one thing to do: we went in search of beer. Having failed to secure a table at the more central (and touristy) beer hall, our backup, Moritz, quickly made room for us, three starry eyed travellers. I think it is important to note that one of my companions was a journalism student from Taiwan who had never before consumed more than a single pint in a sitting. I was acutely aware that our surrounds must be all the more foreign to him. Down a spiral staircase off a quiet suburban street was one of the more inviting Czech drinking venues I’ve come across in terms of setting. 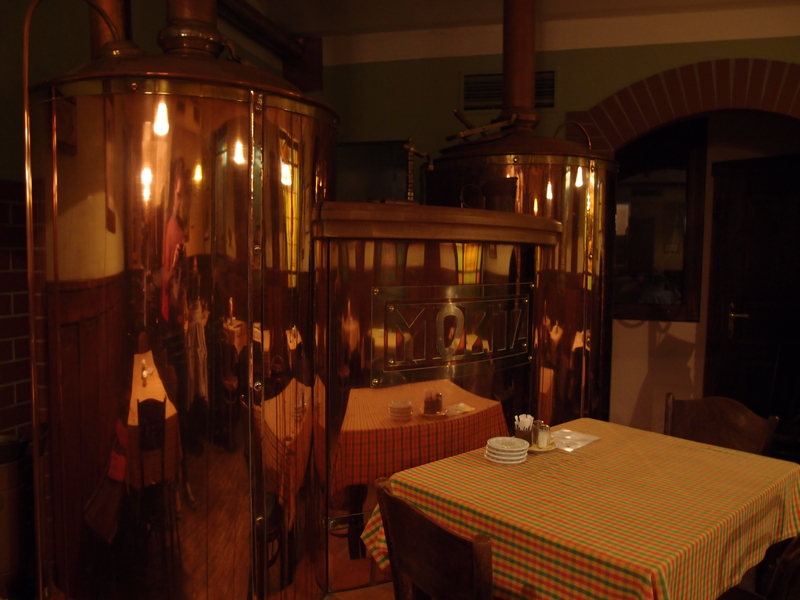 Moritz, the second of Olomouc’s more well-known micro-breweries, houses two dominating brass brewing kettles in the corner of the low ceilinged, warmly lit dining hall and bar. The furnishings are all old posters of ads from a bygone era and various Moravian paraphernalia adorning the walls. With the hum of forty of so Czechs escaping the drizzly Autumn afternoon, I felt as if we were encroaching on a local gem not used to accommodating the hassling students from nearby Brno. I was immediately nostalgic, even though it was my first visit. 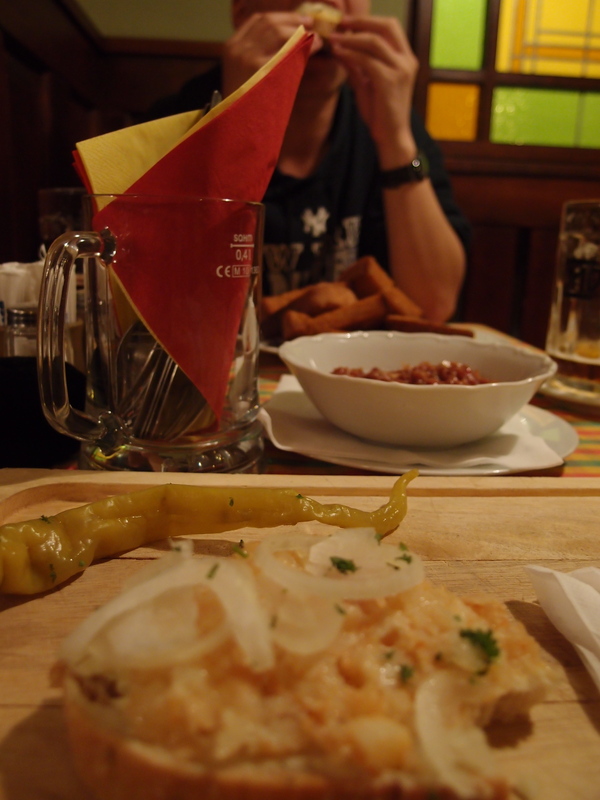 A quick ‘Ahoj’ and ‘pivo prosím’ and three of most delicious beers were on the way. Apparently no matter what other forms the rivalry between Czechs and their neighbours takes, all agree that the best beer emanates from this failed communist utopia. As we drank, probably a little too quickly, my companions set about deciphering the menu while I intrusively took some photos of our delightful surrounds. After half an hour of struggling with a menu that included boar stew and the ever present pork knuckle, the multilingual waiter presented us with English menus, pointing out that the menu we had was in fact for a celebration in a fortnight or so. A sigh of relief that we wouldn’t have to guess our way through another dinner was quickly halted by the realisation that we had yet another overseas dining faux pas to add to the list. From the short ‘pub-food plus’ menu, we selected a couple of local staples – the Moravian cheese I mentioned earlier, and a regional take on steak tartare. I ordered a prime 250g slab of fillet steak whilst the other two settled on various preparations of pork and venison. 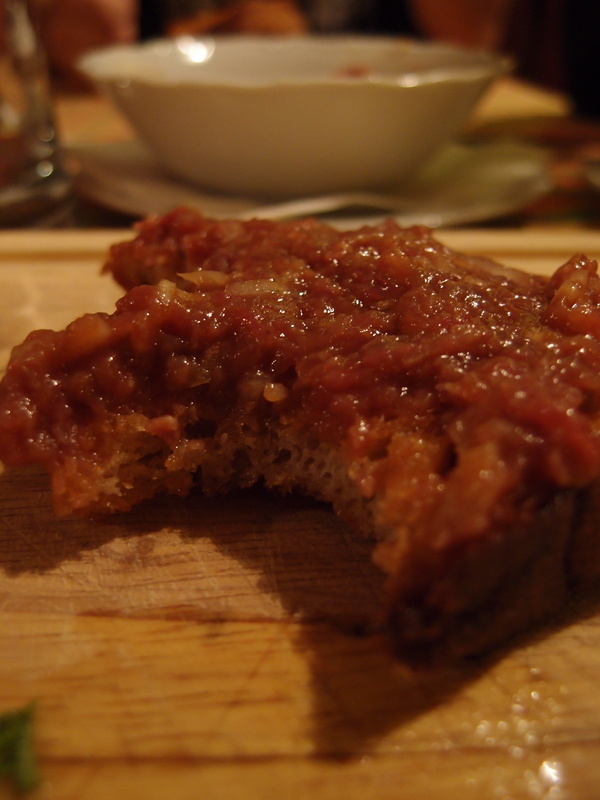 The cheese tasted like a ripe washed rind to me – thick and pungent that when mixed with the white onion rings and slightly aniseed bread formed a flavour that seemed to linger like the smell of your feet after a hard days bushwalking. Not necessarily unpleasant but certainly unmistakeable. It was moreish without either of us necessarily being able to explain why we kept on putting it in our mouths. There was definitely a moment of two where I felt like we looked like a trio of sows at the trough that have been starved for days. As a study into eating habits, I’m sure it would have been rather compelling if not a little concerning. The tartare was a definite highlight. I would say probably the best of our travels so far. Spicy, cold and full of garlic and pepper served with fried bread. The beef was obviously of a quality sufficient to pull of a dish that requires a real love of red meat and the flavours you can enjoy. As I was contemplating our meal at Moritz and thinking on how much the local Czech cuisine concentrates on meat with such intensity that at times, I think besides some bread, cheese and potato, the people here are barely omnivores. As a friend of mine likes to say, to the horror of the vegetarians within earshot, salad is what food eats. That certainly feels very much in tune with the Czech approach that can feel a little relentless at times. Nevertheless, my steak was delicious. Cooked to the rare side of medium rare, as requested, and seasoned well with a generous serve of buttery (yet typically waxy) potatoes and the sauce, which screamed cholesterol, but hey, who am I to turn down such a fine example of a green peppercorn sauce? 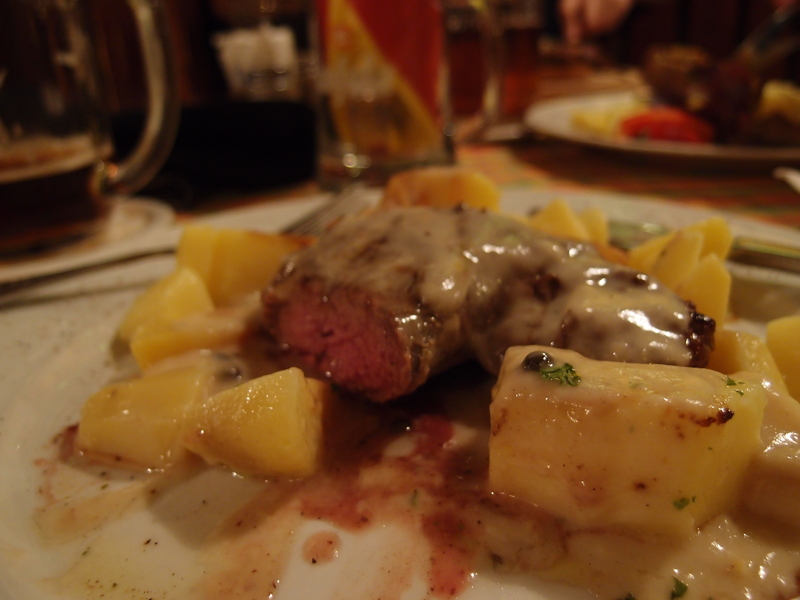 The beer, the meat, the potatoes – it was ideal. As the meal wrapped up and the hum in the restaurant grew to a rosy gaggle, I was pleased with our choice. Moritz isn’t refined, flashy or particularly interesting. But on a cold night, with a couple of drinks under your belt, it is most welcome feast of gluttonous pleasure. The ‘rosy gaggle’ line totally did it for me. excellently crafted piece! such a manly man dinner. Thanks mate, it really was a ‘gaggle’! Follow Food, fullstop by email.